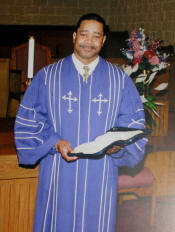 Welcome from Pastor Dwight O. Steele Sr. Welcome to the Pilgrim Baptist Church website. Indeed we count it a privilege and honor that you have an interest in this ministry. You have a standing invitation to join us in any or all of our services. The word of God compels men to assemble, worship God and glorify His Name. By acting in obedience to His word, you release the gift that is inside you and walk into your divine destiny. We are confident that after sharing in one of our worship services, your life will never be the same. It is our desire that the Holy Spirit will reveal His reason for directing you to Pilgrim. We do believe that everyone has a vital and integral mission in the body of Christ. May the Kingdom of God prosper in your life is our prayer and together, may the lives of humanity be changed because of what we know the Holy Spirit will do when we become those witnesses that the book of Acts declares, after the Holy Spirit has come upon us. Again, many thanks and May God’s power and divine grace rest upon you. The Family Life Center will host a fellowship breakfast on the third Sunday of each month free of charge (donations are accepted), following the 7:45am service in the gymnasium. 4/18/19 in observance of Holy Week Service. Please plan to join the Gospel Chorus as they pause to say THANK YOU LORD for another year! The Pilgrim Baptist Church College Scholarship will be available March 20 - May 20, 2019. They are available online and in the church office. These are for Pilgrim Baptist Church High School students only who are planning on attending college in the fall. AARP Virginia is planning a series of listening events to hear from caregivers about the challenges they endure while caring for family members. We invite you to share your story so that AARP Virginia can make sure that our elected officials find ways to support family caregivers in our state. While legislators appreciate data to help them understand an issue, people's stories have been found to have the most impact on their thinking. Please RSVP by calling 1-877-926-8300 or register online at aarp.cvent.com/CaregiverListeningRoanoke425 to join in the discussion and make your voice heard! Hot Smoke and Fish fry on Saturday, April 27, 2019, from 11:00 a.m. to 2:00 p.m.
Come and support this event. Enjoy the Theme Park, Water Park and the JoyFest Gospel Music Festival featuring gospel music artist, Marvin Sapp, Mary Mary and many more!